Why is it that Saturday mornings are the hardest for me to roll out of bed? I think it is because every other day of the week we have school, work or church and I have a reason that makes me get up. Saturdays are much more difficult. It would be fine if I could sleep in the morning but that isn’t the case. I just lie there thinking and lately the thinking part is not good for me. So this morning (Saturday morning) I was telling myself that I needed to stop thinking about life and just get up since I can’t sleep anymore. So I pushed myself out of bed (pretty hard to do to oneself LOL). But now looking back I am sure glad I did because if I hadn’t I would have missed a “small moment” and wouldn’t even had known it. This particular morning my oldest pre-teen son was already up by 8am (unheard of on a Saturday morning). He is preparing well for those teenage years of sleeping in on the weekend. But not this weekend. So I am in the kitchen checking my email on my computer when he says, “Hey mom, could you make breakfast?’ Well, I don’t really want to admit to you but in my head I am thinking, “Hell no, it was hard enough to just get out of bed this morning, I don’t want to have to make breakfast too.” But what I really said to him was, “Sure, what do you want?” I was thinking his usual, bagel/cream cheese or cereal. I could have that ready in no time and get back to my emails. But no not this morning, he says to me, “Could you make some bacon?” I probably don’t have to tell you what was going through my head at that moment but I will. I was thinking, “Come On, REALLY! Maybe I can just sneak back upstairs and go back to bed and he will forget he asked me. He is busy playing on his computer any ways.” But what I really said to him was, “Sure!” So I started to get the bacon out of the refrigerator and put the pan on the stove when my needy son then asks, “Could you make pancakes as well?” Ok, so before I blow a gasket and without telling you what was going through my mind I said to him, “Look, I will make the bacon if you make the pancakes.” I thought for sure that would be the end of the conversation because my son is not the one who is interested in cooking. But before I could turn around he was up and heading towards the kitchen. 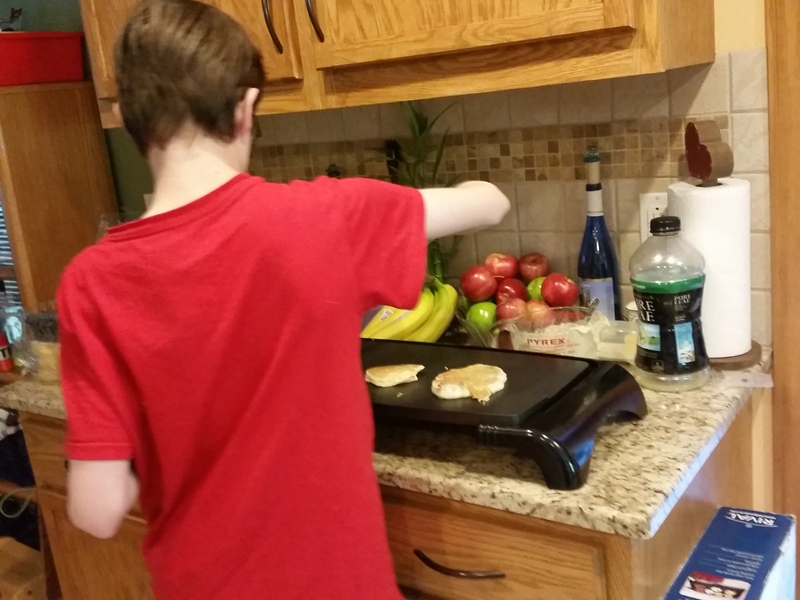 See this is my “small moment in my day.” My son likes to have things done for him but he started to take this home economics class and they are teaching him how to cook and it is sparking some interest in him now. Or he is just growing up either way I like it. So I spent the next half hour – forty five minutes in the kitchen with my son teaching him how to make pancakes and he wanted to know if he could put blueberries in them too. Our interaction was great. We had fun. For those who know my son, spending quality time in the kitchen is a huge deal. Don’t get me wrong we have a very good relationship. He comes home from school every day and he starts to talk the minute he opens the door about his day. I love that time and I know that it won’t last forever so I savor those “small moments” each and every day. Even his younger brother came in to the kitchen and asked if he could help. He is the more adventurous one and always wants to be a part of doing something. I didn’t want to discourage him from wanting to be a part of our moment but I also didn’t want my older son to feel like his younger brother was moving in our special time. So we all agreed that he would be in charge of making the eggs. Another grand feat that everyone agreed. Try to take some time today and notice your “small moments” in your day. It is amazing how much they can help you out of your funk. 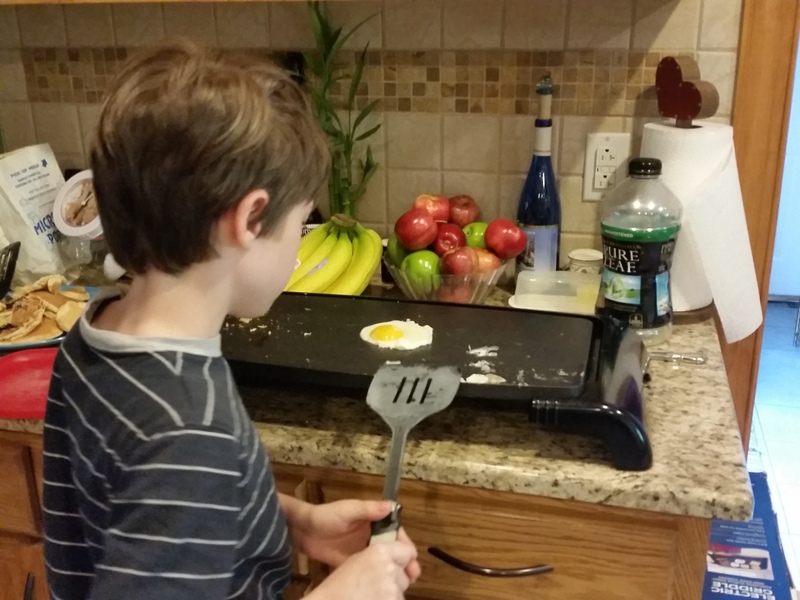 This entry was posted in family and tagged boys, breakfast, family, family life, hope, inspiration, kids, little things, pre-teens, small moments. Bookmark the permalink. I am beginning to feel the same way. Maybe that is because they keep us so busy day to day we have more interaction with them then anyone else. I am sure I will be writing more small moments about them in future posts. Thanks for following! !